Osaka, Japan – Glasses are an enigma among solid phases. Like crystalline solids they are hard, but unlike crystals they are amorphous on the molecular scale. Because of this structural disorder, each piece of glass is technically out of equilibrium, and unique. As a result, its properties depend not only on its chemical ingredients, but on how it was cooled. Their amorphousness makes it tricky to describe glasses with a general model. Now, however, a team led by Osaka University has used simulations to connect the annealing (cooling or compression) of a glass with its mechanical response to strain. In particular, their study – published in Science Advances – focused on two key metrics of solid behavior, elasticity and plasticity. When deformed by shear strain, an “elastic” solid returns to its original shape after the strain is released. Plastics, in contrast, permanently retain their new shape. This contrast between “reversible” and “irreversible” changes has implications for how materials respond to mechanical forces – in the body, in technical applications, and even on the geological scale. Each glass showed four basic trends. Under small strains they were perfectly elastic. At higher strains they became partially plastic, failing to recover the original state when the deformation was partly lifted. Eventually they face either of the two opposite fates at larger strains: total failure by fracturing (yielding) to release stress, or complete stop by jamming (becoming congested). 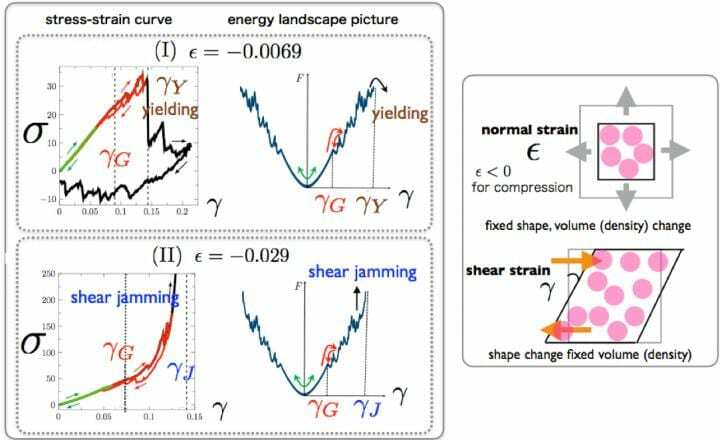 The region between yielding and jamming on the phase diagram defined where the original glass remained stable. Condensed soft matter is found throughout technology and nature–for example, in foams, emulsions and biological tissues. Because such condensed soft matter, like glass, is amorphous, a deeper understanding of how to tailor the properties of glasses may have a wider impact on material design. The article, “A stability-reversibility map unifies elasticity, plasticity, yielding, and jamming in hard sphere glasses,” was published in Science Advances at DOI: https://doi.org/10.1126/sciadv.aat6387.